Cartoons give better advice than your parents ever did. As a kid, I read and reread the various “Calvin and Hobbes” collections my dad had stashed away in my parents' bathroom. I spent God knows how many hours reading them from cover to cover, admiring the mischievous cartoon boy and his witty partner in crime. Getting lost in Bill Watterson’s magical world became one of my favorite childhood pastimes. When I flip through those collections today, I’m struck by Watterson’s masterful ability to capture the universalities of the human condition, regardless of age. Calvin’s wise-beyond-his-years musings like “Reality is ruining my life” have taken on new meaning but remain just as hilariously poignant as they were 15 years ago when I was flipping through Calvin and Hobbes for the first time. When I was ten, reality was struggling through math homework and gutting it out at soccer practice. Today, it’s paying rent and scrounging up just enough quarters to do a load of laundry. Bill Watterson’s comics are still a tremendous source of insightful, bite-sized meditations on life. 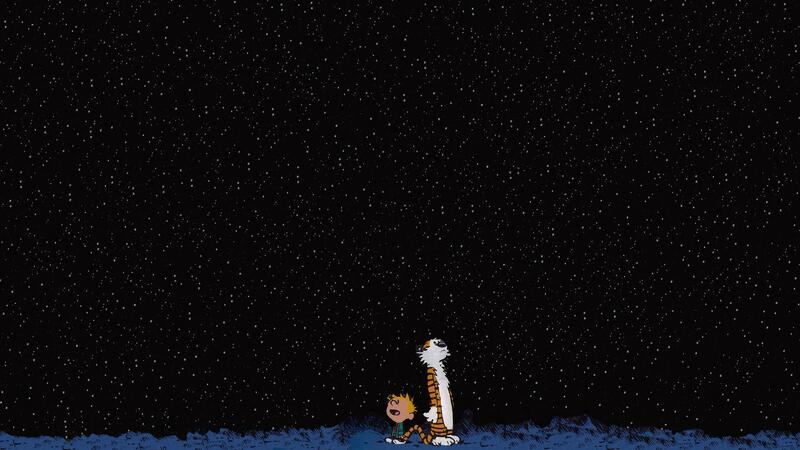 Here is a not-exhaustive list of life lessons learned from Calvin and Hobbes. Having a sense of humor makes life a little easier. When it comes to the mysteries of existence, you can either lament them or laugh about them. If you read comics, you’re choosing to laugh about ‘em. There’s the short term and the long term, but don’t forget the very long term. Don’t get too overwhelmed by life’s responsibilities and forget to enjoy the ride. After all, memories are what you’ll treasure most in the very long term, as Calvin wisely points out. You are not required to follow a pre-determined path, even if that path is as perfectly mapped out like dots in a coloring book. Don’t be so afraid to break the pattern and forge your own path that you don't do you. Calvin and Hobbes represented #squadgoals before the hashtag was even a spec in Instagram’s eye. The duo mused on morality and if life has meaning and everything in between (like bug barf). No topic is too grandiose or ridiculous when philosophizing with your BFF. It’s a cliché that no one puts more brilliantly than Bill Watterson. Despite the fact that Instagram launched 15 years after Bill Watterson’s comic series ended, his strip is particularly poignant in today’s social-media driven world. It’s tempting to take perfectly styled shots on Instagram at face value. It’s better to remember that no one’s life is perfect. We’re all just cropping out the mess… and adding filters to further obscure reality. Just fake it, and you'll make it like everybody else does. Taking a step back and viewing a situation from a different perspective can make a world of difference. For an anxious kid who worried excessively about everything from acing a spelling test to fitting in on the playground, this was a crucial lesson. From time to time, I still grapple with putting things into perspective. Calvin gave me a head start on adopting this concept into real-life practice. The grind can live up to it’s name if you’re not doing something you love. Gain inspiration from Calvin. Take the time to pursue a passion that drives you, like building a robot. Find the work that you want to make yourself do. This is, of course, inspired by the last strip in the “Calvin and Hobbes” series. Leave it to the insightful Bill Watterson to remind us one last time that there’s always more to discover. All comics by Bill Watterson via GoComics.